Do you ever see a kids craft activity and drool, just itching with anticipation until you can do the project with your kids? 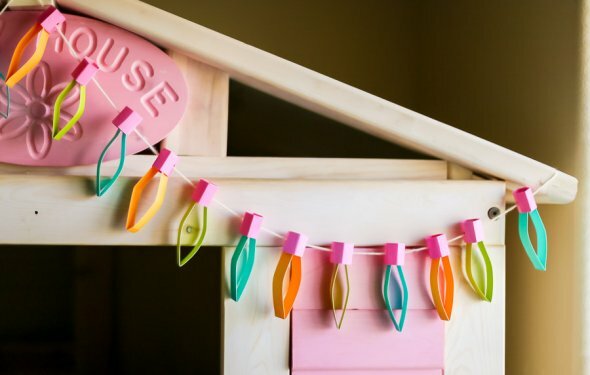 I had that when I saw this Paper Craft post from Marie, of Make and Takes (*LOVE* her blog, follow her for tons of other kids crafts, you won’t be disappointed). She used scraps of paper to create paper cubes. We made one and were hooked… there is a growing installation of ceiling art in our play room. We are hanging the paper cubes as we make more! You will need a variety of colors of paper. We used this multi-color pack of neon paper – love how bright the colors are! Cut your paper into strips. It is not super important how long or wide your pieces are as long as they are all the same size. We made our strips 4 1/4″ long (paper cut in half) and then roughly 2 inches wide. Also needed is a cup of glue with Q-tips. The Q-tips were so handy to put glue into those crevices. You will need 12 strips of paper for each cube. Fold each slip in half “like a hotdog”. Make a “tray” with four of the strips. For extra stability, try to layer the corners. Glue them down and then add the “legs” of the table. Again, try to layer the sides for extra stability. Glue the legs into place. Make sure that each corner is tight and flush with the other. If you don’t your square will be lopsided or may not work. For the top of the cube, do one side at a time. We found that it got confusing for the kids, so it helped to do the whole top, put it into place and then glue it down. These blocks are addictive. You won’t want to make one, you’ll want a dozen! We stacked them and then hung our blocks from the ceiling. Super cool!! After you make a couple together your kids can make the blocks independently. Our 3 year old had fun helping us glue. Our five year old has been making them all by herself! fashion royalty kyu Royal leather Shoes for Fashion Royalty (Integrity Toys) dolls. Shoes. Features 4 sheets each of Silver Scratch & Sparkle?, Rainbow Black?, Rainbow White?, and Scratch-Lite? Stained Glass Sheets.